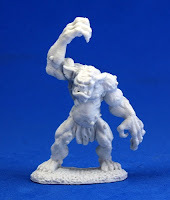 One of my first Frugal GM posts was about Reaper's Dark Haven Bones line. I was fortunate enough to be able to attend the Origins Game Fair this year and spend way too much time at the Reaper booth. OK, to be fair to the fine folks at Reaper I did not spend "too much" time at their booth. Truth be told I almost spent too much time there....any longer and I would have blown my budget on minis. The Reaper booth was well-stocked with minis, as one would expect, but tow things really caught my eye. The first was just the selection of assorted weapons packs. My local stores seldom have any weapons packs, much less the whole line. For special use minis (like my favorite PCs) I like to spend a little time customizing the mini to get it just right. The second thing that caught my eye was of course the small panel of Bones figures. They had the whole line of 12 figures there, right along side the fully painted figures. Comparing them side by side was helpful. I snagged several sets of Kobolds, a couple of Orcs, and two Ogres. The Kobolds excited me the most because at 6 for $3.49 I could afford to have a whole army of the little buggers! The same figures pre-painted were $5.99 for three. I really appreciated getting to hold these figures in my hand. They were so lightweight and the plastic was firm, but forgiving. As someone who often travels to GM, having "real" minis that are lightweight and can stand to get jostled around are a real plus. The only question left is, "How well do they paint?" One of the Origins events I've never attended, and I'm kicking myself for not leaving enough time for it until this year, is the Reaper painting booth. In the dealer's hall, just next to the Reaper booth they have a large number of tables set aside with chairs and painting supplies. For the price of free (!) you can choose one miniature to paint up. 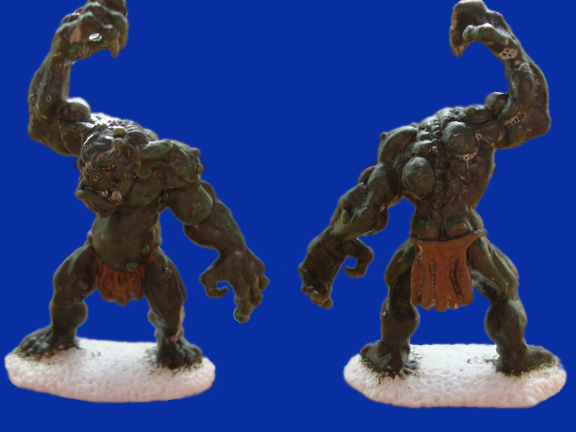 I was able to snag the next to last Bones Cave Troll they had and challenged myself to get it fully painted in less than an hour. The hard part was using the Reaper Master Series Paints. Don't get me wrong, they were great paints, but although they had a decent selection I was used to a much wider array of (albeit cheaper) paints, a few more brushes, and a better setup than a single paper towel, plate, and small bowl of water. Waiting for the paint to dry was like.....well waiting for paint to dry. I think I did a decent enough job with the exception of using their clear sealer. In my haste of using a new product I put way too much on and it dried with these unattractive bubbles. I usually use a spray and maybe I should have waited until I got home to clear-coat it. The mini took paint very well and it looks and feels great. You can bend the arms a bit and it'll bounce right back no problems. I didn't have to prime the figure, but I think I would still prefer to prime them black, even if it is just a light dusting to help highlight the various contours as I'm working. Until I slathered on a dull green base coat I was not able to really see the fine details of this sculpt. I'm hoping they really expand this line because I personally find them superior to the metal minis in almost every way. If you can stop by a Reaper painting event at a convention, I highly recommend that you do so. You'll get a free mini, get to check out their brand of paints, and get to relax a bit and paint. Relaxing at a convention is sometimes hard to do, but maybe you can fit it in while waiting for your paint to dry.